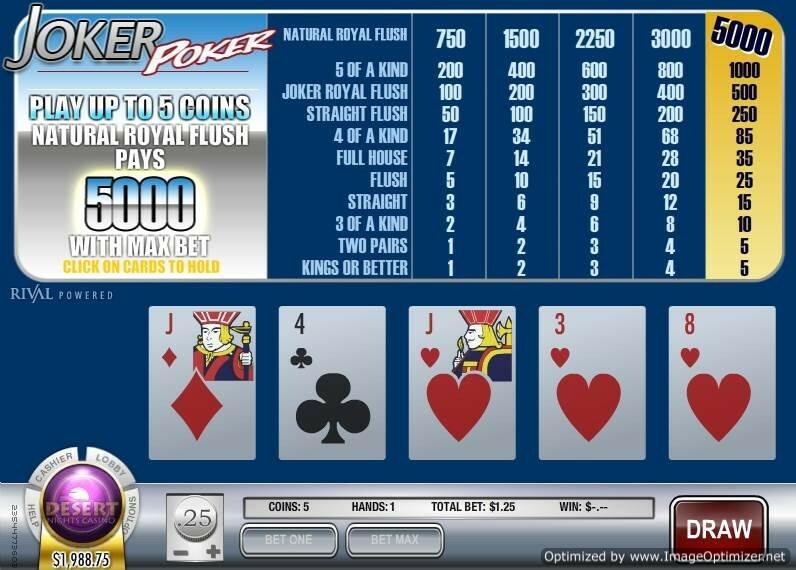 Joker Poker is a video poker game with one wild card. Jokers here can be substituted for any winning combination. This game could also be called kings or better because that's what you need to win. Initially you are dealt 5 cards after placing your wager. If you have a winning hand off of these 5 cards the computer will select them for you. This is always nice, but you should keep an eye out for other possible hands that may pay better and wouldn't be auto selected. To switch the cards that are being held all you have to do is click on them and then click those that you do want. If you don't like any of your cards you can select draw and get a whole new 5 card set. Winnings are all based upon your wager, you can view a pay table within the game. In Joker Poker you can play with coins in value from 5 cents to 5 dollars. Joker poker also allows for play of up to 5 coins per hand. The best hand you can receive is a natural royal flush, this will pay up to 5000 coins! More than a lot of the other video poker games pay for a natural flush. The other pay outs are quite a bit lower, the next best hand you can receive is 5 of a kind which pays close to 4000 less than a natural royal flush.